… but if you’re in a long-term relationship, you know the sour truth! When was the last time you felt love in your relationship? When it comes to love, people feel differently and show it in many different ways. You may have felt the love in the heady early stages of the relationship, but as life takes over, it may feel like it has slipped away. 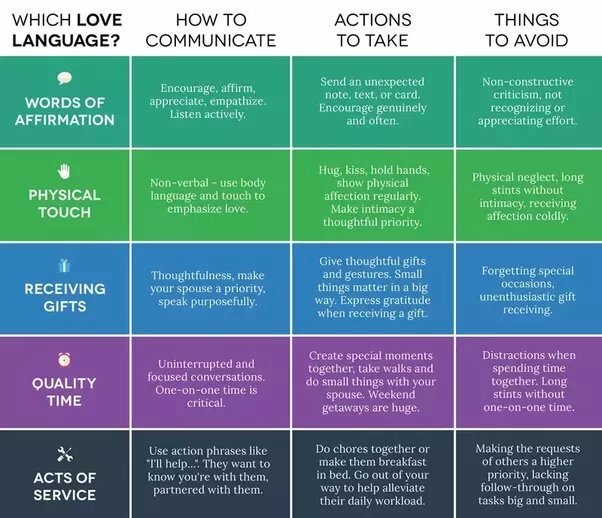 Instead of assuming you are not loved and ending the relationship, Dr Gary Chapman’s Five Love Languages may just help to save your relationship. Through his experience as a marriage counsellor, Dr Gary Chapman realised that a fundamental problem in relationships is not that partners don’t love each other, but they are not showing their love in a way a partner can see or wants. This problem comes from people speaking different love languages. In his book, The Five Love Languages, Dr Chapman analyses the five different love languages which explain how people want to receive and deliver love. It describes the different languages, helping people to decode their partner and work out what our partner really wants or expects from us. What If We Are Different? If two people speak different love languages, it is not the end of a relationship. However, understanding and adapting to love languages that you and your partner crave could rescue your relationship without leading to separation or divorce. Marital and relationship conflict and divorce can increase depression, anxiety and poor psychological well-being. Studies have shown that married people have higher life satisfaction that lasts long into old age. So addressing and resolving problems in your relationship now can make you both happier. 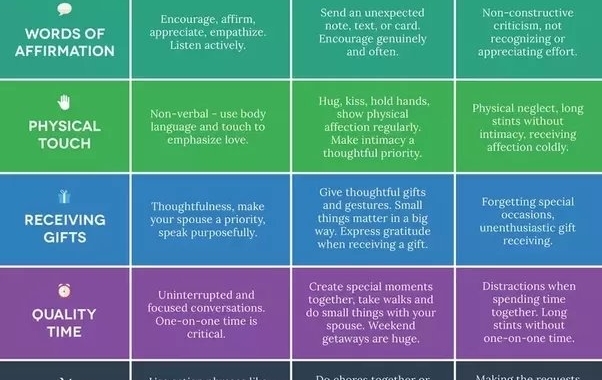 So can the Five Love Languages help to improve your relationship? Some people like to hear words that affirm them and their relationship. Those who prefer words of affirmation will value the importance of words. Typically, they like being told they’re loved, hearing compliments and having their partner communicate affection. On the other hand, any negative and hurtful language will hurt this person, and they may not forgive hurtful language easily. Be mindful of the words you use. Are you kind, humble and encouraging? Send a note, text or email out of the blue to compliment your partner or say something loving. For a person with words of affirmation as their love language, these are the keys to their heart. Over to you: What would you like your partner to say to you? People who identify with this love language will want undivided attention with their partner. Comfort and satisfaction will come from spending time together and going on dates. Hurt may come from a partner who is distracted (e.g. checking their phone during a conversation), failing to listen and people who postpone spending time together. One of the best things you can do for your partner who has a love language of quality time is to do something your partner loves to do with them and do it for them. I believe the greatest act of love is doing something for someone else without a need or want in return. Remember, it is perfectly healthy to have different hobbies and interests from your partner, and this can enrich the relationship. You do not have to do everything together, but doing something together for your partner can significantly help with quality time. I also recommend that you spend 15 minutes of every day having a quality conversation with your partner. This requires active listening. This means you do not become distracted by your own thoughts or formulate a response; you simply listen to what they have to say. Self-revelation is also important. This is where you talk about your feelings. 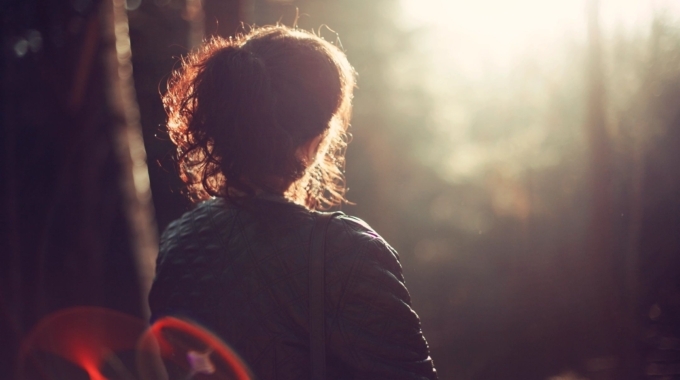 Over to you: When was the last time you actively listened to your partner without distraction? This category is for people who feel most loved when their partner presents them with a tangible gift. This does not have to be expensive gifts but thoughtful presents and personal touches to make the person feel appreciated. For someone who has a receiving gifts language, it is important to realise that you don’t have to buy gifts continually. Instead, it can be the gift of presence. Homemade gifts are also a winner as it really is the thought that counts. Over to you: When did you last receive a ‘just because’ present? For people in this category, actions are louder than words. Acts of service will be gestures that someone can do for their partner to help them and relieve any stress. This could be helping around the house or working with you on a project. People who fall under this category may have little tolerance for people who break promises or are perceived to be lazy. Remember, that for those who have an act of service language, it may not be lots of acts that make them feel loved, but one particular act that really shows you care. Over to you: What one act of service will make THE difference in your relationship? Those who have a primary physical touch language will be those who love all the physical connections they have with their partner. Not only in the bedroom, but physical touch lovers will also enjoy the everyday connections such as hugging and hand-holding. For those with a physical touch language, it is the touch that you only share with your partner. 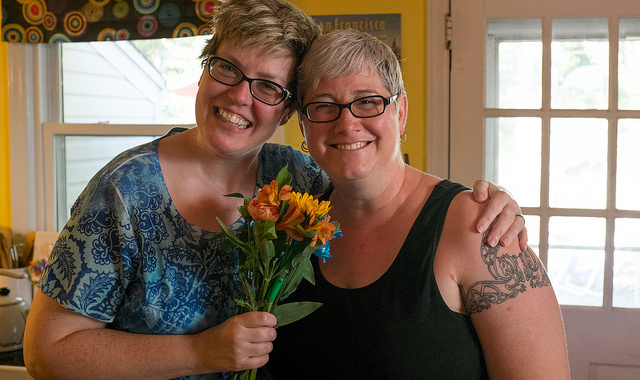 Hugging friends and family will be a different touch to how you touch your partner. I believe it is a cry for help in your relationship if you have gone for months without any physical contact, regardless of whether physical touch is your primary or secondary love language. Homework: What ways can you introduce physical touch in your relationship? You can find out what your love language is by taking Dr Chapman’s 5 Love Languages online test. It is free and easy to do and could reveal something that may surprise you about your own love language behaviour. While we usually have an idea about our own love language, it may be harder to determine to love language of your partner. Your partner’s criticism will provide the greatest clue to your primary love language. It is normal to have a primary and secondary love language, so there is no one-size-fits-all approach but understanding your love language and discussing with your partner can be incredibly beneficial for improving your communication, how you love each other and your relationship as a whole. Looking To Improve Your Relationship Further? If there are still some relationship issues you want to address, then I offer hypnotherapy for all types of relationship issues, from handling breakups to improving confidence and overcoming relationship hurdles. We can also discuss your love languages results and how you can adopt these into everyday life for relationship satisfaction. To book your free 15-minute consultation, call me on 0207 971 7677.